Is there a correlation between sleep and dementia? Dementia and Alzheimer’s disease are growing more prominent in the U.S., underscoring the importance of preventive strategies. New research published in the journal Sleep suggests that adequate amounts of sleep are important for healthy aging within the brain. 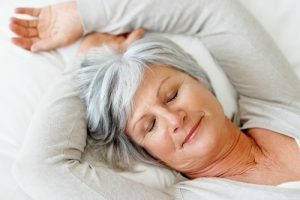 It’s important to find solutions to your sleep problems now, because researchers have found that changes in the brain associated with cognitive decline and dementia begin decades sooner than previously thought. The earlier that you start taking steps to promote healthier aging, the easier it will be for you to stay mentally sharp and live independently as you age. One way that researchers and doctors can assess the age and overall health of the brain is to look at a structure known as the brain ventricle. The larger the brain ventricle is, the more likely the individual is to show signs of cognitive decline or dementia. For the new Sleep study, researchers from Singapore investigated the impact of sleep on neurological health by inspecting the brain ventricles of 66 Chinese adults who participated in the Singapore-Longitudinal Aging Brain Study. All of these individuals were at least 55 years of age. Every two years during the study period, the researchers conducted neurological tests, performed MRI brain scans and distributed questionnaires that collected information on sleep habits. Results showed that those who got the least amount of sleep showed the fastest growth in their brain ventricles. Additionally, their performance scores on the neurological tests worsened. After reviewing the data they collected, the study authors reiterated that it was important for adults to get approximately seven hours of sleep a day to protect the health of their brains as they age. While it is important for you to get an adequate amount of rest every night, the long-term health of your brain depends on several other lifestyle choices. For example, neurology experts now know that the well-being of the brain is largely dependent on having a healthy circulatory system, which nourishes the brain with oxygen and nutrients. Anything that hurts the circulation may negatively impact the brain. This means that you can support your neurological health by making heart-healthy choices, such as eating better food and exercising more. Additionally, neurology experts emphasize the importance of keeping the brain stimulated by engaging socially with the people around you, taking up interesting hobbies, or learning new skills. Personal health advisors can refer you to experts who will address both sleep problems and lifestyle adjustments to promote healthy aging for your brain. Different individuals will respond to different therapies, and seeing the right professionals will ensure that you find a customized regimen that works for you.